Ash and Elm horticulture is a partnership between Myself, Emma and my husband David. The name came from David’s surname Ashley and my initials ELM. Hence Ash & Elm. We are based in Mid Wales, just outside the small town Llanidloes. Striving to enhance the long-term well-being of people and the planet, using agroecological practices. Through creating diverse systems that build biodiversity and strengthen communities. Providing local wholesome food and flowers to feed body and spirit. 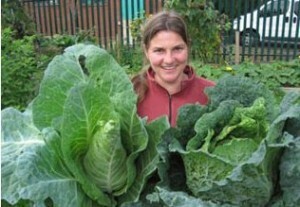 We have been growing the majority of our own veg, fruit and flowers for over 20 years. 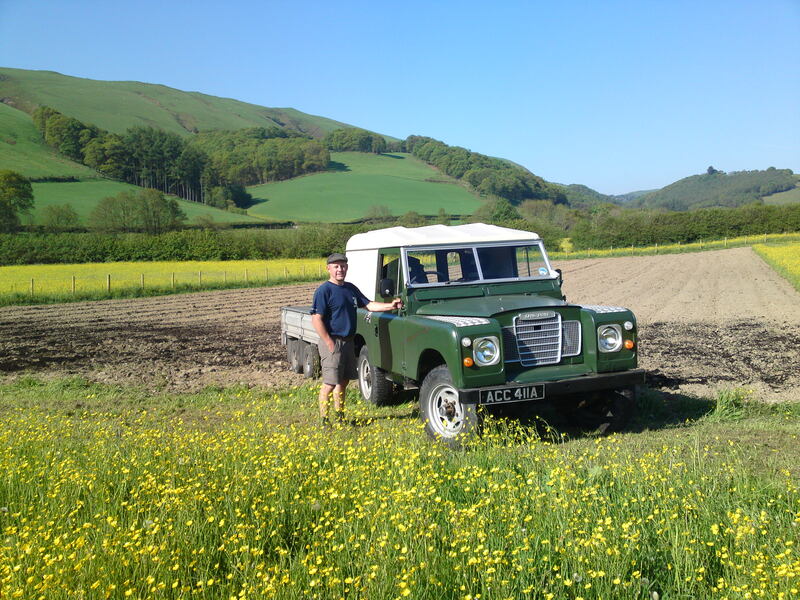 For 10 years we cultivated an acre, which mostly fed us, with the excess being sold to the local organic shop ‘Great Oak Foods’ and the florists. 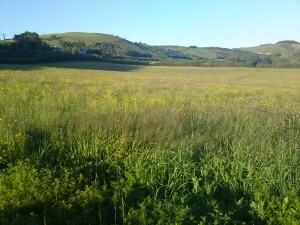 In 2011 we started developing a new five acres plot of land using agroecological principles. Cae Felyn is the name we have given our new land, it is Welsh for yellow field; yellow with dandelions in spring followed by yellow meadow buttercups and now planted with over a tonne and a half of yellow daffodils for cutting. 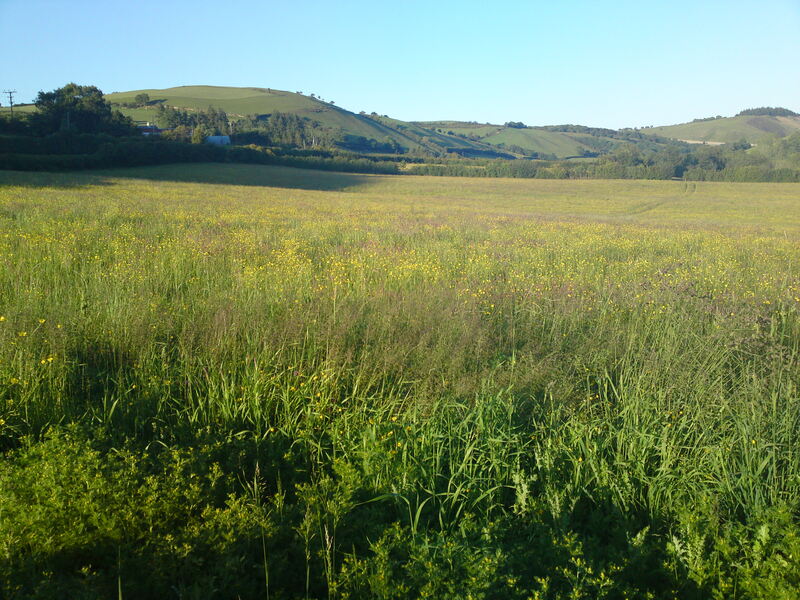 We purchased this five acre field in November 2011 as a large open area of grass, that had been kept organically and used for grazing cows and cut for hay. Our aim is to convert it into a diverse agroecological market garden, introducing agro-forestry hedges and tree rows. I trained in Organic and sustainable horticulture, I am passionate about local growing and strive to encourage and assist anyone to get involved and have a go. 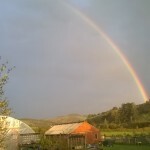 As well as growing our market garden I also teach horticulture, do landscape designs, advisory work, talks and assist in the establishment and development of community gardens. 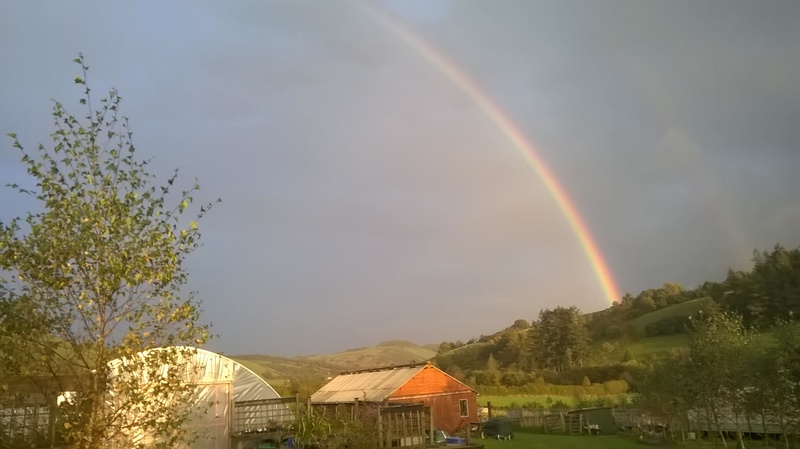 I am a director of Great Oak Foods local Organic shop Llanidloes and Cultivate a workers and producers local food co-op based in Newtown. Since 2018 we started the Llanidloes Food Festival, promoting vegetarian and vegan food, health, diet and good farming practices. This has now become a yearly event in May. Currently working as a growers mentor for Mach Maethalon‘s Pathways to Farming Project. David has spent years working as a social care manager whilst also working our land. Now we have taken on more land, he has dedicated his time to gardening. Working on our own land to develop it as a sustainable productive market garden. He is a woodland worker, enjoying clearing overgrown gardens and returning trees and shrubs to their sculptural beauty. He is chief nut collector and monitors our hazel & cob nuts to harvest then before the grey squirrels. We have now links with frinds in mainland Europe with nut trees, which we harvest. You can order Sweet Chestnuts, Almonds and Walnuts to go along with our own hazelnuts. During our first winter we were busy planting trees and hedging as well as an acre orchard and starting to develop the soft fruit area. 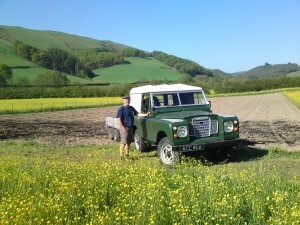 Our first summer season was very wet, but we grew some veg for our self and an acre of potatoes for sale. We also learnt a lot about grass and harvesting 3 acres of hay by hand. During our first winter on the new site we transplanted the rest of the plants from our previous field, 1 tonne of daffodil bulbs and lots of raspberries among other things. We are continue to plant more trees each winter to slow down the wind and create an agro-forestry system. We have started planting the edible and useful woodland garden with mixed perennial crops for human grazing, this will provide shelter for the flower cutting beds. During our second summer we started developing ridge and furrow vegetable beds over an acre of land, with 2 lots of 10 beds separated by mixed nitrogen fixing and edible hedges. During 2013 we put half the polytunnel up and later in the autumn we erected our large shed. During 2014 we had the joy of starting to see the effects of all our efforts, with diverse wildlife moving in across the land; hedgehogs, many birds and insects. We purchased a tractor so that we could cut and harvest the bulk of our hay mechanically. 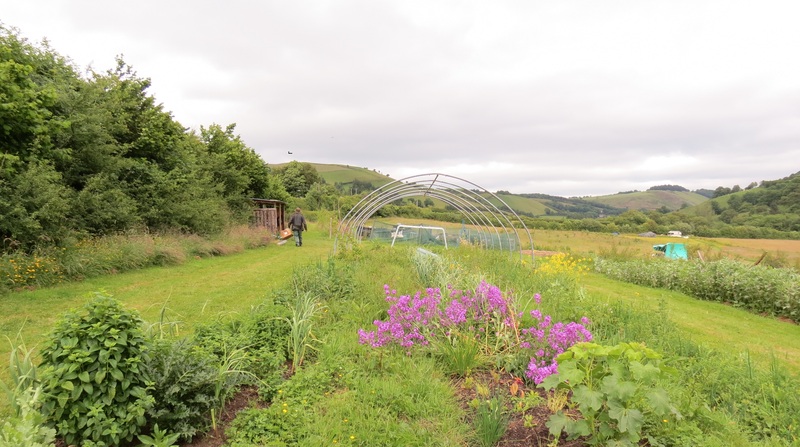 During 2015 we expanded the polytunnel to 30m and re-skinned it giving us growing space to grow tender crops for sale and somewhere to work on rainy days. The water harvesting systems is improving each year, in 2016 we increased our collection capacity to over 10,000 litres and installed piped water to the pigs, outdoor veg and chicken pen. We extend the toilet block to give storage for bee equipment and a larger water collecting roof providing water for the polytunnels. We have built more raised flower beds, planting more trees and hedges, and erecting wind break fences and stock fencing. In 2017 we are really starting to see the structure of the field forming different working areas with micro climates developing. We are installing a solar pump and porous pipe automated irrigation system in the polytunnel. We always have many construction jobs. We have built a generator shed to provide some lighting and run power tools, and Dave has installed a system that will easily switch from 12 volt batteries charged by solar and back to the generator when needed. We have now extended the entrance shed to give us a coat and boot changing room. No longer do we have to take the wet and mud from the field into our cars. 2017 we expanded the veg growing to field scale, another acre this time cultivated by the tractor, seed potatoes for Sarpo. A very wet summer, cold long snowy winter follower by 2018, 3 month of drought. As we emerged into spring the 5m glass propagation house went up. The acre of alliums didn’t like the dry summer as water was in short supply, now up to 18,000 litres of collected rain water, but it only lasts a month. The barn is having major repairs to strengthen it and internal rooms with falls, giving clean vermin prof packing space. The pigs are now gone and we return to our roots of horticulture. We have two open days this year 2019…19th May & 27th & 28th July.